21 inches tall by 8 inches in diameter. Drainage holes in seed pan. Hand-crafted, beautifully decorative stained glass with copper accent, lead soldering and electroplate. Feed songbirds or use inside as a candy dish or for potpourri. 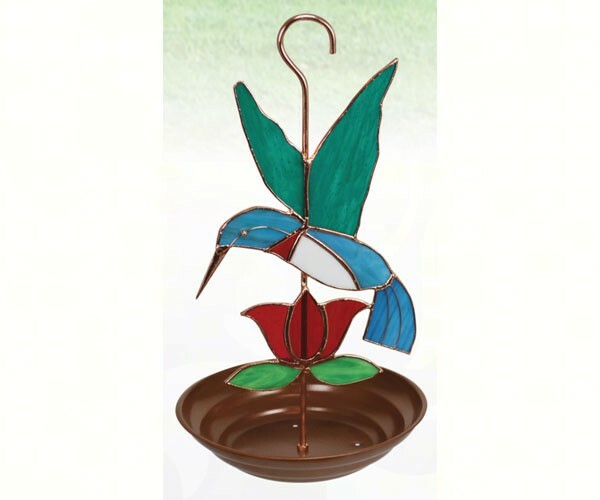 Give your home and backyard the gift of style with a gorgeous stained glass bird feeder. These feeders are built with high quality materials that will leave them looking great for years. Weather proof, even in harsh weather. Colors will not fade, peel, or scratch off. Tray bird feeders attract many songbirds like Cardinals, Chickadees, Titmice and more!